Lots of hubbub is going on right now around the young Ahmed Mohamed, a 14 year old student living in Texas who brought a homemade clock to school, only to be arrested because his teachers and the police believed it to be a bomb. 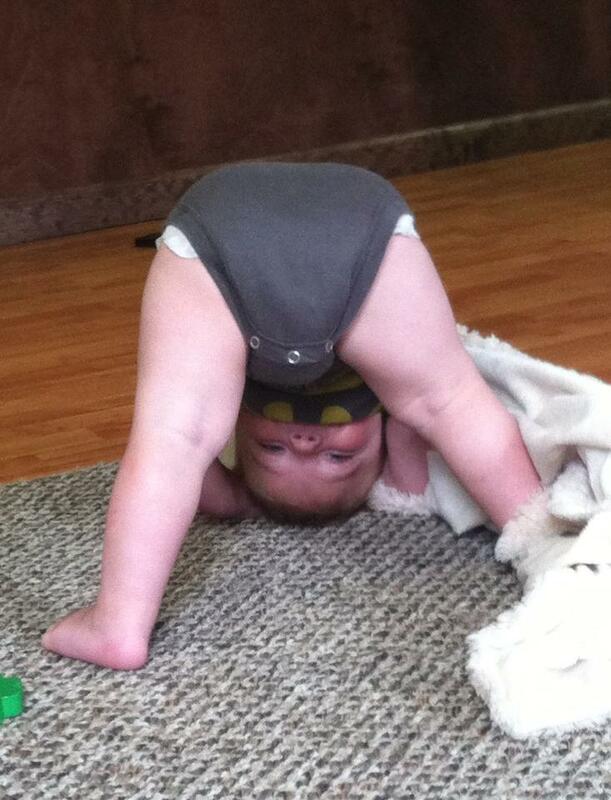 Ahmed’s cousin says he’s a genius at that kind of stuff. Ahmed’s dad says he’s brilliant. Ahmed says he made a clock. And he said that several times, which the authorities deemed “uncooperative”. I call it redundant. The thing is, I’ve taught in public schools for ten years. Lots and lots of kids. Lots and lots of Muslim kids, to be quite frank. I could have been that teacher, that English teacher who called the principal, who then called the police, who then handcuffed him, interrogated him, and wouldn’t let him call his parents. I can’t tell you that I wouldn’t be alarmed if I saw a kid pull a box with a bunch of wires out of his backpack. I also can’t tell you that I would think to be alarmed. One day, several years back, my teaching partner (a former U.S. Marine) had to call a Code Red, or Code Yellow, or whatever, because he saw (from about 200 feet away) a parent walk in to the building with a gun on a holster. Turns out this parent was a victim of domestic violence who felt the need for protection, came to pick up her kid, and forgot it was there. If I remember correctly, it was also unloaded. (If you’re wondering, that’s still not allowed!) I left that day thinking I was glad John was my teaching partner because God knows I wouldn’t have noticed a gun on someone’s hip unless they were right smack in front of me. It was a good thing SOMEONE was looking out for us all. That lady wasn’t arrested. She was questioned in the principal’s office, and sent home, with a reminder to not bring her gun when she picks up her child. It’s not that I’m ignorant. I’m also not unobservant. Sometimes I’m just too busy teaching my students, learning who they are as people, to notice anything else. I have a feeling a teacher like me might have noticed the sparkle in Ahmed’s eyes coming from the pride he felt at his creation before noticing his clock looks vaguely like something I might see on NCIS. On days like this, I know my former colleagues and I would have a lot of conversations about Ahmed. We had students who could have been Ahmed. As a matter of fact, I know that I have had at least one student who shares that same name. Even though I’m out of the classroom now, I am still a teacher, and I have to weigh in: Why wasn’t Ahmed afforded the same treatment that the mother who HAD AN ACTUAL GUN had? Why wasn’t he asked, simply, to not bring in things that some hyper-vigilant teachers might consider bombs? Now I weigh in as a mom: Thanks, teacher for considering the safety of your students. But how can you call yourself a teacher with such a closed mind? Did he tell you it was a clock? Yes. Did it turn out to be a clock when it was tested? Yes. No student is going to open his or her mind and heart to you if you can’t see the true beauty and intelligence in a young mind when its product is literally sitting there on your desk. And to reach my kids, to reach any kids, that’s what you need: their open hearts and minds. It was much anticipated. It was dreaded. It was inevitable. It was Harrison’s first trip to the dentist. I didn’t know how it possibly could go well, so I employed a “fake it til you make it” approach. We talked it up; there would be cool tools (he asked if the dentist had a tape measure…), there would be all kinds of flavors of toothpaste (“Can you tell me all the flavors again?”), and there would probably be prizes at the end. Well, dear readers, I regret to inform you that Harrison did just fine at the dentist and there was absolutely nothing noteworthy about his appointment. I was really hoping for some fantastic blogging material to blossom out of this major life event, however, he really let us down. He acted like a normal, civilized human being the entire time. He got to look at the cool tools (no tape measure), he picked out bubblegum toothpaste, and, indeed, he got some great prizes at the end. It was within these great prizes that a story is found. Inside Harrison’s goodie bag, he received typical dentist parting gifts, such as a toothbrush and dental floss. There were also various dollar store trinkets in there, including a rubber stretchy frog. From the moment he was gifted this gem, it remained in his hand. We even had to name it (James) and make it a bed. It requested an extra cup of milk upon waking up and hot dogs for breakfast (that request was denied). A mere 21 hours after this new favorite toy came into Harrison’s possession, tragedy struck. While I was quietly sipping my coffee, I heard Harrison wailing from the top of the stairs. Not at all worried that something actually serious was wrong, I flew up the stairs to comfort him because Ella was still asleep and I didn’t want him to wake her. 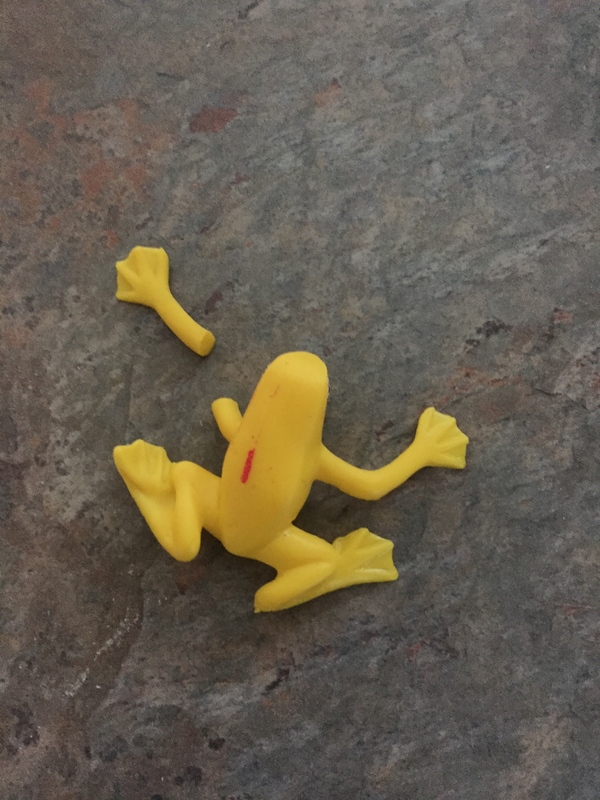 When I retrieved him from the steps in a puddle of tears, he blubbered that his frog had lost its arm. In other words, he pulled his frog’s arm so hard that it fell off. Since I am obviously very crafty and intelligent, I knew I could right this wrong. Actually, I tried to tell Harrison that he could still love his frog even if it only had one arm, but apparently we haven’t reached the point of childhood development where beauty comes in all shapes and sizes. So, back to being crafty and intelligent, I pulled out the medicine box and got to work. 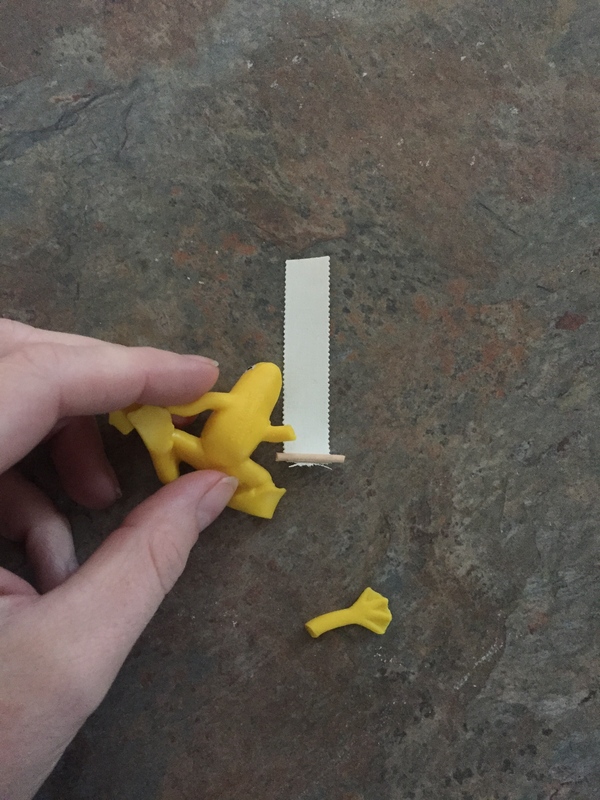 The first thing I did was cut a toothpick to make a tiny splint so that I could reattach the frog’s arm with medical tape. This was a fantastic plan, but it immediately fell off once I wrapped it. Then I decided that this frog’s dire situation required his arm to be in a sling. You guys. I seriously thought I was brilliant. I explained to Harrison that his frog needed to rest like this until his arm healed. 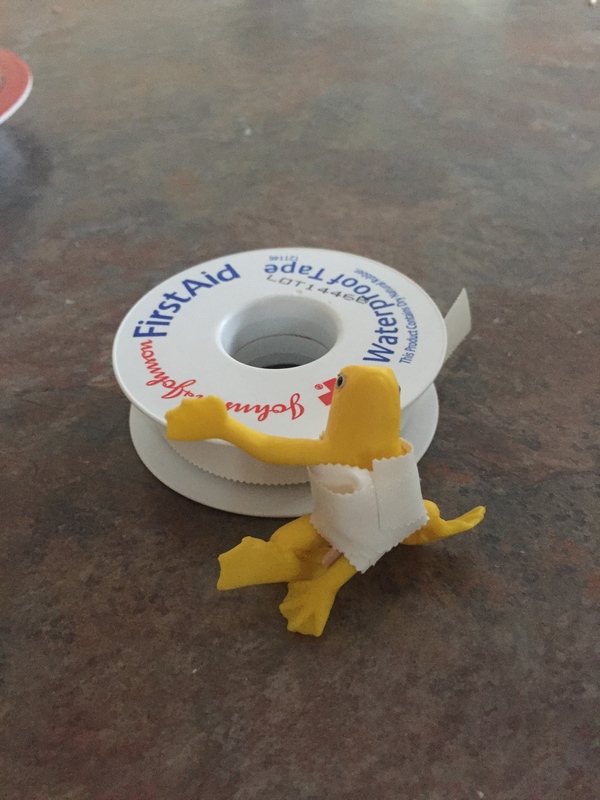 I figured that he would tire of the frog before he realized that I didn’t in fact have a medical degree and that dollar store toys were not meant to be repaired. Unfortunately, 3 year old boys do not know how to play gently and the frog’s arm soon became dislodged from my fantastic sling. Have you ever stitched together a rubber frog? Because I have. Now. Now, I have. Out of complete necessity I repaired my son’s current prized possession with a needle and thread. Much to my mother’s dismay, my cleverness and craftiness does not stretch to sewing, however, I think I did a pretty good job. 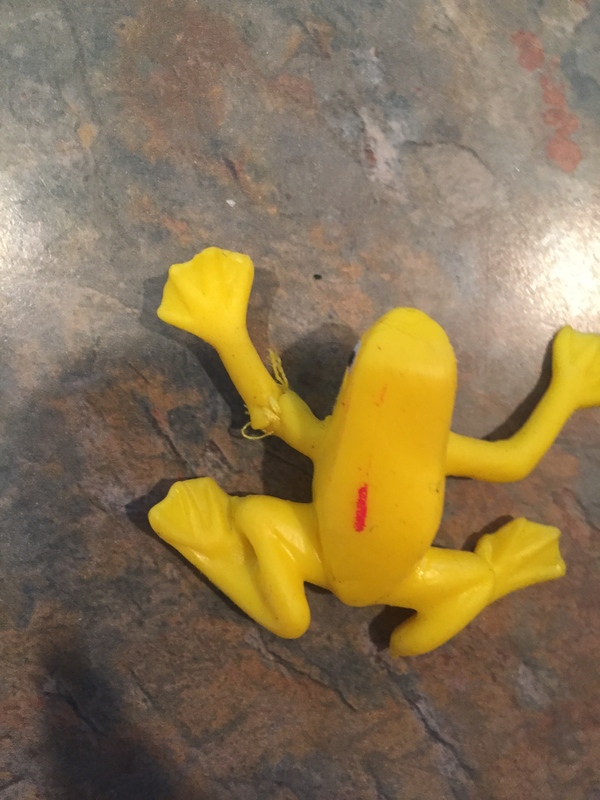 You can BARELY tell that this frog has been repaired. Justin asked me when the stitches were going to come out, to which I responded with an evil glare, because Harrison then turned hopefully to me to see when his frog should return to the infirmary of our kitchen counter for the removal of sutures. Never. The stitches are never coming out. James the frog rested peacefully in its own bed, full on hot dogs (wish was granted for lunch) and tater tots after a long day of playing in its new pond (the baby pool in our front yard) and going on several tractor rides with a prime spot right between the handle bars of Harrison’s ride on toy. Apparently this toy isn’t going to lose its luster after a few hours, even if it does have permanent stitches. Today would have been my first day of school had I gone back to work instead of becoming a stay at home mom. Sometimes I really miss work, especially when I think about my former students and colleagues. Sometimes I really miss work when my own kids are screaming and I haven’t had a hot cup of coffee or a moment of peace in weeks. Today, I stepped back to look at what I had gained with my new lifestyle. There was no rushed morning. There was no trying to get dressed for work while two toddlers were clamoring for treasures in my makeup drawer. There was no forcing down a quick breakfast before we flew out the door. There was no searching to see if the bags I packed contained everything we all needed to make it through the day. There was Harrison in my lap, with his blanket, watching cartoons and drinking milk. There was Ella, sleeping until 8am and quietly waking up, cooing sweet sounds from her crib. There I was, able to fix a beloved toy for a devastated little boy. There was his smile when the tiny frog’s arm had been reattached. There we were, lapping up another summer day outside in the kiddie pool. There we were, drawing pictures on the driveway with chalk. There we were, playing tag in our front yard. There we were, laughing hysterically at the funny faces we took turns making over lunch. There was Harrison, asking for snuggles after his nap, and falling back asleep in my arms as I took in the scent of baby shampoo from his freshly washed hair. I stared at his pink cheeks and inky eyelashes, peaceful and content and beautiful. There was Ella, discovering her world with delight-collecting rocks, hiding potato chips behind the couch, babbling new words and sounds all the while. Sometimes I worry about my retirement fund, which is basically nonexistent, and think I should get back to work to fix that. Sometimes I worry that I won’t be able to get back to work because teaching jobs around here for an English teacher aren’t exactly a dime a dozen. Then I have days like this, when I know I’m in the right place, doing the right thing.